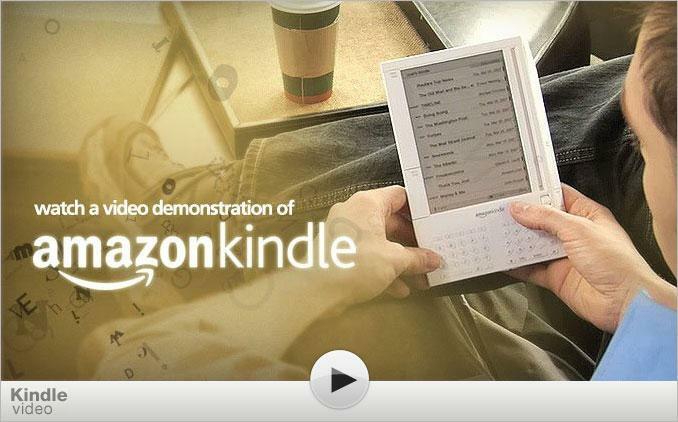 Online retailer Amazon grabbed the spotlight on Monday when it announced the Kindle, a handheld e-book reader it says should do for digital text what Apple's iPod has done for music. Amazon hopes that it can break e-book reading out of its niche by integrating unique hardware with a special online service, similar to the teamwork shown between the iPod and the iTunes Store. Key to the integration is the device's built-in, pervasive Internet access and a special section of Amazon's online store dedicated to digital publications. Instead of using short-range Wi-Fi, the Kindle taps into Sprint's much larger 3G cellular network and uses this primarily to load its content on to the device: although it has an SD card slot and a USB cable, Amazon expects most users to download their reading material online, regardless of where they may be. Titled Whispernet, the Amazon's access is completely free to use: owners are only charged for what they buy, not for the bandwidth used. Most of this buying will be done through Amazon's own digital bookstore, the company says. Echoing part of Apple's approach to the iTunes Wi-Fi Music Store, the Kindle can buy text online without requiring a computer. It also offers more than just individual book downloads and lets users subscribe to magazines and newspapers that are automatically downloaded shortly after the print version is published. Costs range from $1.25 per month for some magazines to $10 for a typical book and $15 for a subscription to an international paper such as Le Monde. And like the iPod touch, the Kindle can also browse the web: while RSS feeds of certain blogs are available in a Kindle-ready format for one to two dollars each per month, the reader also includes a basic web browser and quick access to Wikipedia. The handheld even has its own e-mail address to receive web pages, Word files, and images as attachments for ten cents each. No matter how attractive the product, however, Amazon's Kindle launch may have unintentionally mirrored the climate surrounding the 2001 introduction of the iPod. Like the Apple jukebox, the Kindle is launching at $399 into a market which has yet to fully embrace the product category. Still, Amazon —which based its core business on selling books as far back as 1994 —hopes it can make e-book readers as common place as digital media players are today. The retailer said it plans to begin shipping Kindle on Wednesday.